The sight of a roaring fire in a rustic brick fireplace is enough to warm the heart on a cold night. It’s a comfort many people instinctively crave in winter. Added to the pleasure is the belief you’re saving money while heating the home. But are you really? The warm glow is undeniably beautiful. Unfortunately, many waste energy and fail to heat homes as well as they could. There are several ways to get the most from your masonry fireplace. Learn how to use your fireplace efficiently with these tips and tricks. Gas appliances are available in both decorative models and efficient models that heat. A vented gas ﬁre with an open front should be considered a decorative model—ideal for enhancing a warm atmosphere during family get-togethers and romantic date nights. Vented decorative gas ﬁres use room air—air that you’ve paid to heat to 70 degrees -for combustion, and send the fumes up the chimney. For an efficient vented gas ﬁre, look for a model with a ﬁxed glass front; these are available in both ﬁreplaces for new construction or inserts that are retroﬁt into an existing ﬁreplace. Direct Vent models use outdoor air for combustion and vent the fumes outdoors. Direct vent models can heat several hundred to more than 2000 sq. ft. Freestanding direct vent gas stoves that look like wood stoves are also available, which provide a means of adding a gas ﬁre to a small space. Direct vent gas appliances offer multiple venting options and can be installed in nearly any room. Vent free (unvented, or ventless) gas ﬁres use room air for combustion and vent gas byproducts back into the home. They are efficient heaters but can be problematic for individuals with certain health conditions, so do your homework before deciding if this option is right for you. Gas ﬁres can satisfy a number of visual wish lists. Choose from models with simulated logs, coals, stones, glass and more to ex- press your individual style and décor, be it modern, traditional or vintage. Popular for decades in Europe, are becoming a popular choice. Simply plug in an electric ﬁreplace, insert or freestanding stove and you’re able to heat small areas of 400 square feet or so. You get the ambiance of a ﬁre but there are no gas lines to run and no venting is needed. Open masonry ﬁreplaces are simply not efficient. If you burn wood or vented gas logs then consider adding glass doors to your ﬁreplace. Glass doors allow you to close off the ﬁreplace as a wood ﬁre burns down or when gas logs aren’t in use, and help stem the ﬂow of heated room air from escaping up the chimney. Traditional masonry ﬁreplaces can be greatly upgraded with inserts burning gas, wood or wood pellets to lower your heating costs. Get expert advice on how to install them, including any needed chimney lining system needed for the appliance you choose. For your safety, never throw plastics, plywood, synthetic fabrics, coated paper or treated wood on a ﬁre. They release toxins dangerous to both the environment and your health. Damp, unseasoned wood adds to the harmful buildup of creosote in your chimney and produces the least heat. It takes about a full year for split wood to dry in order to burn clean and efficiently. If you’re not sure how to tell if it’s safe to burn, look for cracks at the ends. Another test is striking two seasoned pieces. Those ready to burn will make a cracking sound, while those too wet will sound more like a thud. Cover wood piles on top and leave them open on the sides – cover fully during snowstorms. Keep your piles on raised platforms or holders inches off the ground. Avoid storing more than a few pieces inside or you’ll increase humidity and bring bugs in. 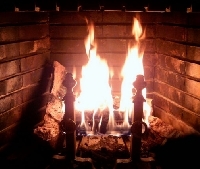 Knowing how to use your ﬁreplace efficiently will help you enjoy a warmer, cleaner winter. Stack the pieces loosely to increase air ﬂow and get it burning hot and clean. Dispose of ashes in a metal container with a tight ﬁttng lid. Many home ﬁres and deck ﬁres have been caused by improperly stored ashes that contain hot embers that reignite. Have your chimney inspected annually and cleaned when needed to prevent chimney ﬁres that can damage your home.